When unveiled several years ago, many people did not fully understand the importance of the iPad. How many of you have heard, “Basically, it’s just like my iPhone but bigger.” You can almost hear the jealously in the quote. To say that an iPad is just a big iPhone is like saying the Space Shuttle was just a big bottle rocket. Now that many organizations are rolling out large scale iPad deployments, I am curious where this will go and what industries will embrace it. One I have seen online is lawyers. Many blogs have been written by lawyers about they use their iPads to help with case reviews, fill out last minute paperwork, and research information online. How about real estate agents? They could use the Zillow app to find properties, use the onboard camera to record pictures and videos of perspective properties, and then use the note taking apps to keep notes on their clients. All this could be done without ever turning on a PC or opening the Mac Air. Another industry I believe will use it more is in hospitals. Currently, doctors walk from room to room seeing patients and reading the files either in a chart or on a computer screen. 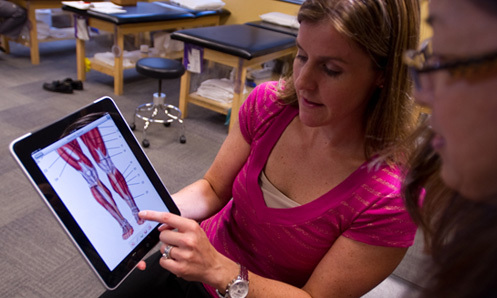 How about if doctors could carry an iPad and access your medical records immediately? Recently there has been a lot of discussion about electronic medical records and their security. Really? Is it any more safe than a paper file left out in the open or on a cart waiting to be reshelved? And of course, the one industry that could definitely benefit from iPad implementation is in education. Now that there are note taking apps that allow the students to keep electronic notebooks (backed up to the cloud, no less) and iBooks to keep them engaged, it will be difficult at first to show the students how the iPad in the classroom is used differently than the iPad at home. I bet it took a while when schools moved from slate and chalk to paper and pencil too. This entry was posted in Apps and tagged industry, interior designer, ipad, lawyer, real estate by eNotebook Team. Bookmark the permalink.